Ten of Cups says follow the beat of your heart and be spontaneous and you will experience fulfillment, deep emotional contentment – the state of lasting happiness and the success that you desire through the realization of your personal hopes and dreams. You will know peace within, contentment and joy at last after pain. An indication of marriage – the perfection of human love and friendship. You find it difficult to accept that everything is working out well – things will happen suddenly. There will be exciting vibrations – a trip that will spell happiness. Your fortune is where your passion is – “listen” to your passions and they will reveal your genius and bring you success. You have the gift of bringing light and good cheer to those around you – your family and relations are important to you, without them you do not feel whole. You need other people to communicate your inspirations and ideas to and their reactions matter to you. You maintain your individuality in your characteristics – but you need a highly social environment in which to express it, for this is what prosperity means to you. God’s grace and love show us that love, imagination and joy come to us as gifts – the rainbow of life promises happiness, not just the absence of pain. In our innocence, we accept happiness as the natural condition of life – expecting it and never wasting it. Allow your “inner” Self to experience the surge of joy – recognize the valuable qualities that exist in every situation. Here is the completion of a major emotional/creative cycle, with outcomes as you would have them. This is the effect on the Emotional/creative Plane of having centered spiritually. Here are the highest possible emotional achievements – emotional longevity. You are emotionally secure, comfortable with your relationships and your self (both inner and outer). You have good emotional support systems in place and functioning. Emotional stability. Life is rich with sensations, meaning, and social interaction. You are as important to others as they are to you. This is the ultimate extension of self, in the Emotional/creative Plane. The terms of emotional/creative continuity and longevity, which can be the base, the encouragement to help you succeed. How are you living in harmony with your environment? Where are you finding joy? What are your hopes for future relationships? What do you want in a family? What needs of family and friends are you serving? Next to any Tens: Change is imminent – how radical will be determined by the number of tens in the spread. Next to Tower: A very definite change in life. Next to Empress: This is a good time to make plans for the future with someone close. In the first position: The archetype of success and happiness as the crowning glory of lessons well-learned in the emotional/creative arena-this is your karmic purpose. Not so much to achieve it, as to live with it and share its lessons with others in all that you do. it will permeate your activities. 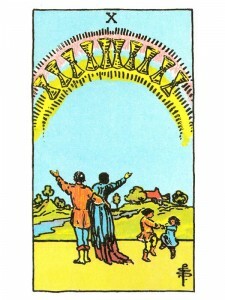 In the second position: Family love, universal love for your emotional resources – you should be a pillar of strength on which many others can depend. You now, in your turn, can make available all that has been made available to you. Emotional bonding and love make material resources available. Most obvious is manpower. People are there when you need them. The lessons of give and take here are perfectly balanced. In the act of giving, you are receiving and in the act of receiving, you are giving at the same time. No debts are incurred. Emotional/creative efficiency! In the third position: An emotional/creative jackpot is at hand. This will Put things in your emotional house right where you want them. Now if you can just package the feeling. In the fourth position: With the ideal of love as your main tapes, this will guide you in your passions and in your creative searches. This is one of the archetypes most advantageous here. Your approach to matters in this plane will be well-disposed to balancing personal and universal love, passion and compassion. In the fifth position: The business of your Emotional Plane is uppermost in your mind, and well it should he from the looks of things. Whether by luck or hard work the present good conditions in vour relationships and/or creative endeavors are set to fast a long time. In the sixth position: You may achieve your major emotional goals for this lifetime much earlier than expected, even in the near future. Success his its own brand of challenge, that your heart will experience as it projects toward even greater possibilities. In the seventh position: Here may be the sense of accomplishment that broadens when others are involved with us in our goals. When you succeed, so do many others. On the positive, this is encouragement that cannot be bought; it must be earned and it is invaluable. In the eighth position: The impact of such emotional and creative abundance on the Physical/material Plane is most welcome. These accomplishments are getting down where you can really enjoy them. This could be the emotional ebullience as the direct result of great financial or athletic news, even of great news about health. The positive effect of the energy being released here is enormous, and it will propel you into the next year with a head start. In the ninth position: This is the feeling we like to imagine as prevalent in holiday celebrations with families, or in successful opening nights after years of creative preparation. This is emotional/creative reward time. In the tenth position: The degree of harmony and success in your Emotional/creative Plane that you achieve not later than this time next year may catch you somewhat off guard.